February is here! 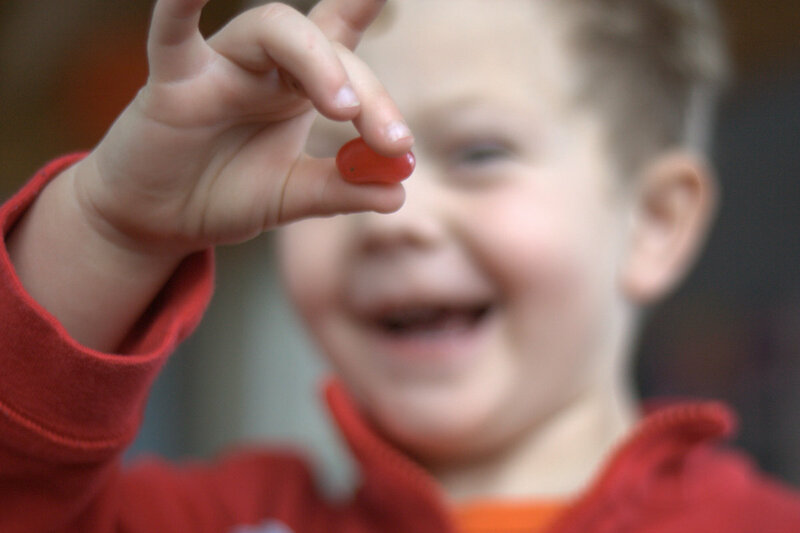 For the next month it will be impossible to buy candy that isn’t pink, red, or at least heart-shaped, and ubiquitous hearts are sure to have permeated every commercial establishment. While I’m not a fan of Hallmark holidays, I am very much a fan of love. In our house, February is a month of extra baking, hearts in everything, and of course, arts and crafts. 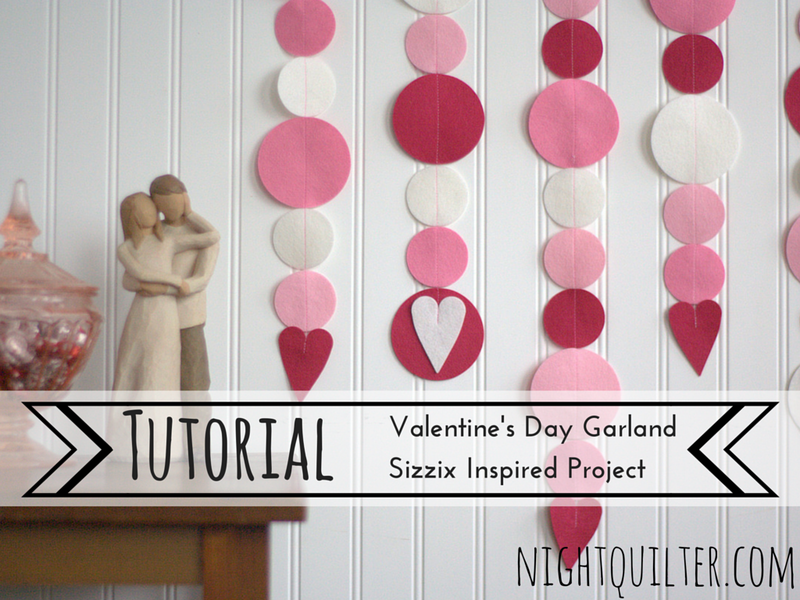 Today I’m going to share a tutorial for how to make a simple yet festive garland. 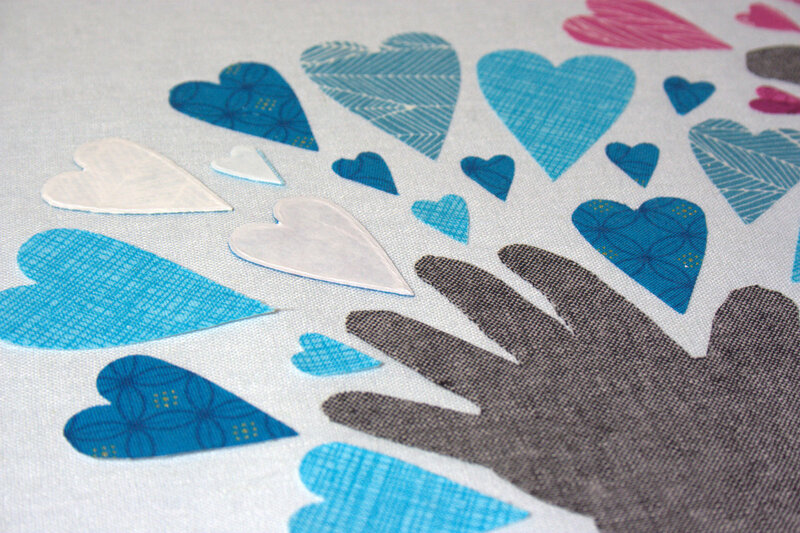 I used my Sizzix fabi die cutting machine to cut the shapes, but you could also cut them with scissors. We hang our garlands from the beams in our kitchen, but you could hang them from a tree branch, along a mantle, or just along a wall for a fun and festive pop of color. I’ve also included affiliate links to products that I use and love. If you click through and purchase with these links, I will receive a small commission that will go toward funding all that goes into creating these tutorials and keeping my blog up and running. 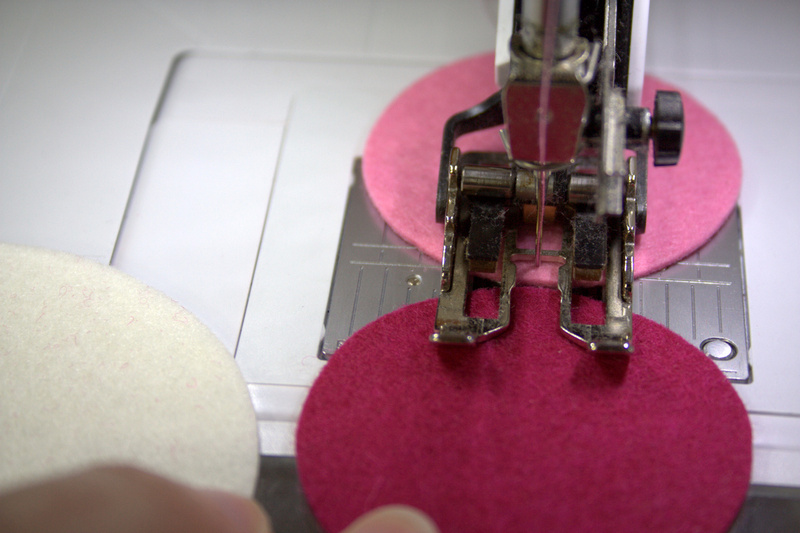 Festive pink cutting pads, if you want! Once you have all of your materials gathered, go ahead and have a chocolate. Now, let’s get started! I found that layering five (5) layers of felt was the ideal number with this 100% wool felt. Note that the top photo shows six (6) layers, and that I did successfully pass the 6 layers through the machine; however, 5 went through much more smoothly so I decided to stick with 5. Either way, you’ll be cutting 5-10 shapes at a time with each pass! 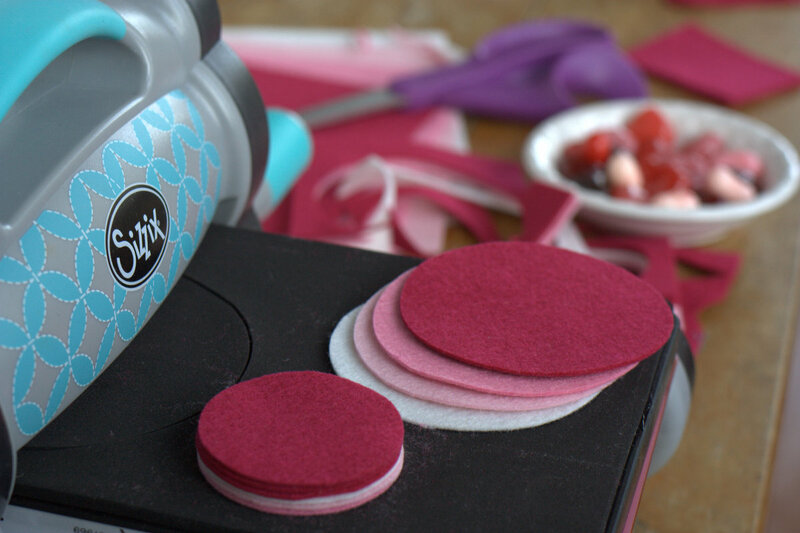 Make your Sizzix sandwich: bottom cutting pad, die with the blades facing up, felt centered over the proper blades, and top cutting pad. 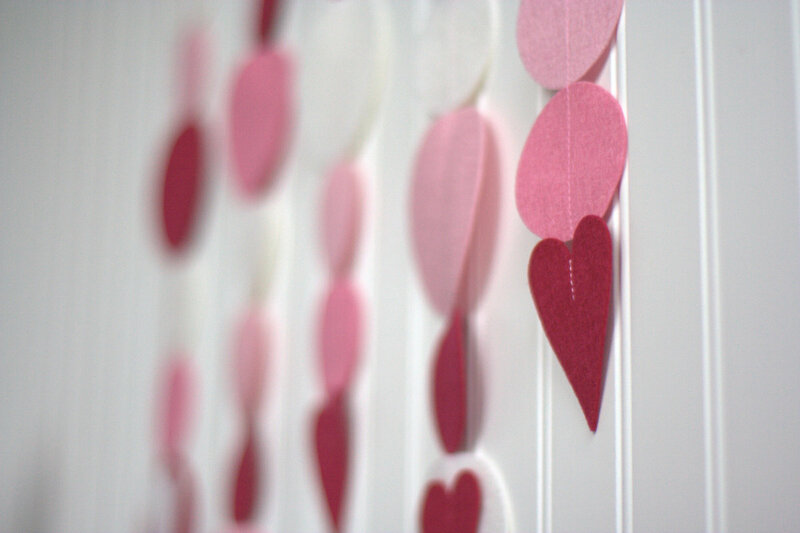 I used the largest heart on the Primitive Hearts die and the 2″ and 3″ circles on the Circle die. 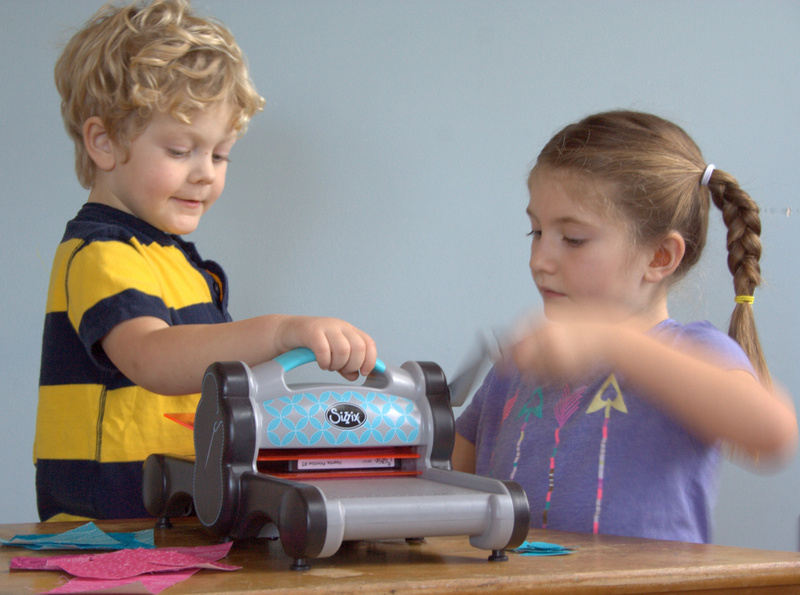 Pass it through your Sizzix die cutting machine and admire your smooth, perfect shapes. 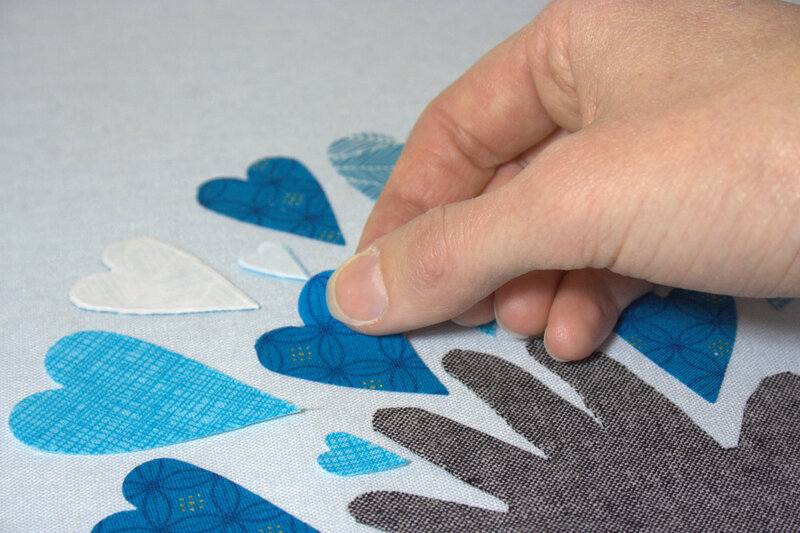 If you are cutting by hand, you can use the bottom of a glass, bottle lid, or any other small approx 2″-3″ item to trace a circle before cutting. For this project, I used two different sized circles for some visual interest. 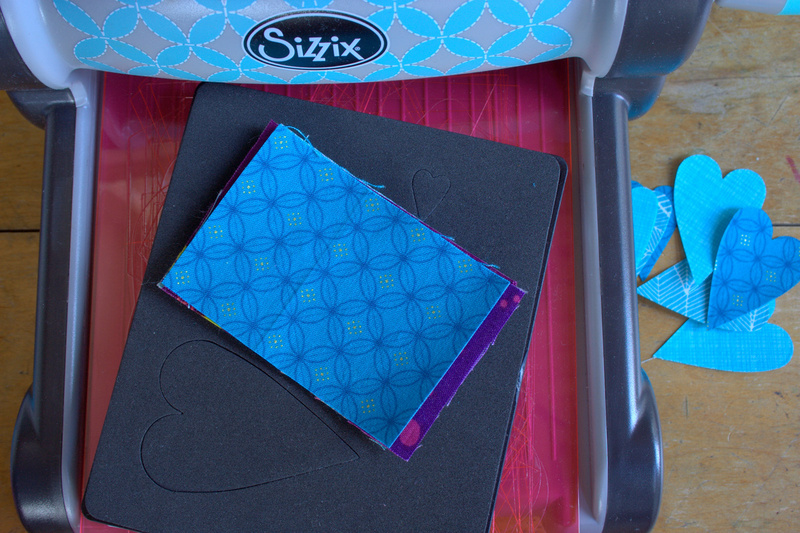 Either by hand or by Sizzix, once you have a good pile of shapes, it’s time to sew them together! I ended up using 33x 2″ circles, 16x 3″ circles, and 6 hearts but depending on how many garlands you want and your desired aesthetic, those numbers may vary. Sewing these together is *really* easy. 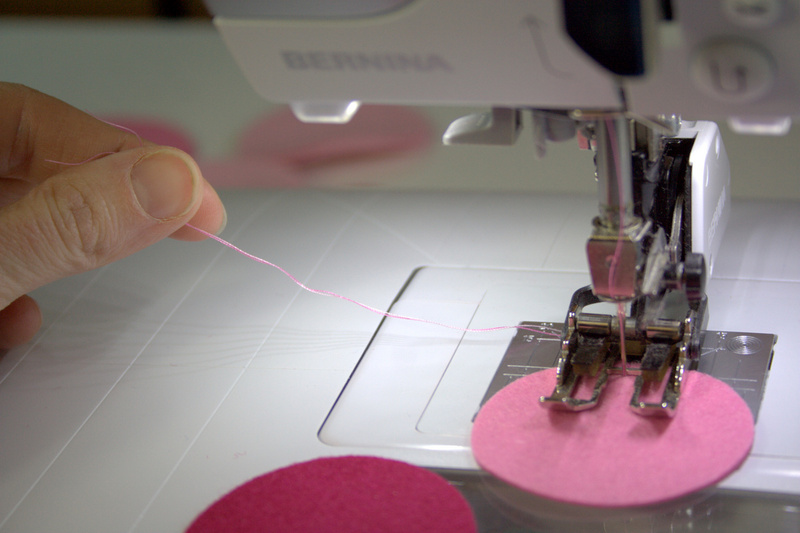 Thread your machine with a coordinating color thread. I used some Aurifil 50wt variegated 3660-Bubblegum that I had left over from a previous project, and it was perfect! Pull out the top thread and bobbin thread so that you have 3-4″ of excess thread held off to the side before you begin sewing (shown above). This excess thread will be simply knotted and used to hang the garlands when they are finished! Now, just start sewing! Sew right down the center of each shape, backstitching at the beginning of first piece and alternating colors and sizes until you have a garland approximately 18″-24″ long. I made each garland different by making a point to vary the shapes by size, shape, and color as I added them to the machine. Once you get to the last shape in your garland strand, sew about 1/2″ into the shape, then backstitch to secure your stitches. Simply trim the threads and you’re finished! If you have little helpers, be sure to guard your snacks! 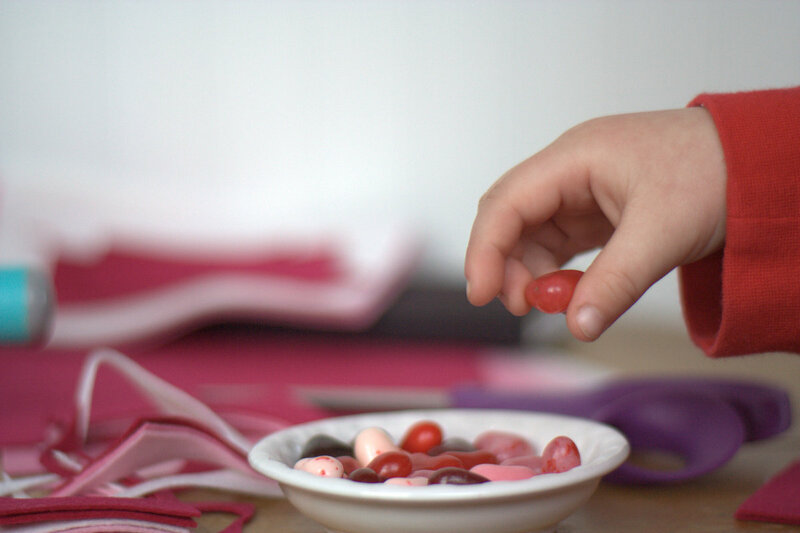 My little helper absolutely delighted in snatching a snack here and there during my project photo shoot. Gotta love him! 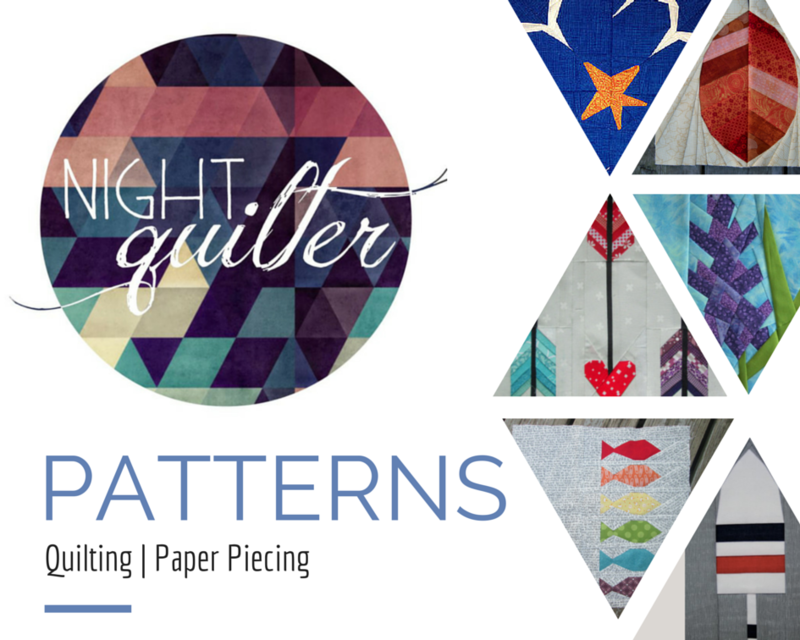 I’m linking up with Stephanie over at Late Night Quilter for her Tips and Tutorials Tuesday. She’s back in the saddle–go check out the great tips she has linking up today! 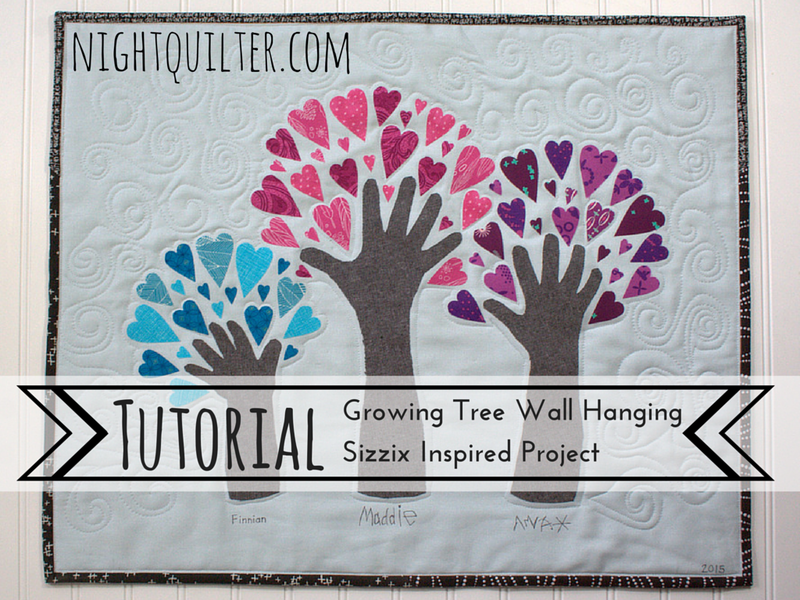 Today I’d like to share a tutorial for a great project that documents the growth of little ones while showing love in a beautiful way: the growing tree. In my case, it will be a growing grove of three trees, so feel free to adapt to fit your kiddos. 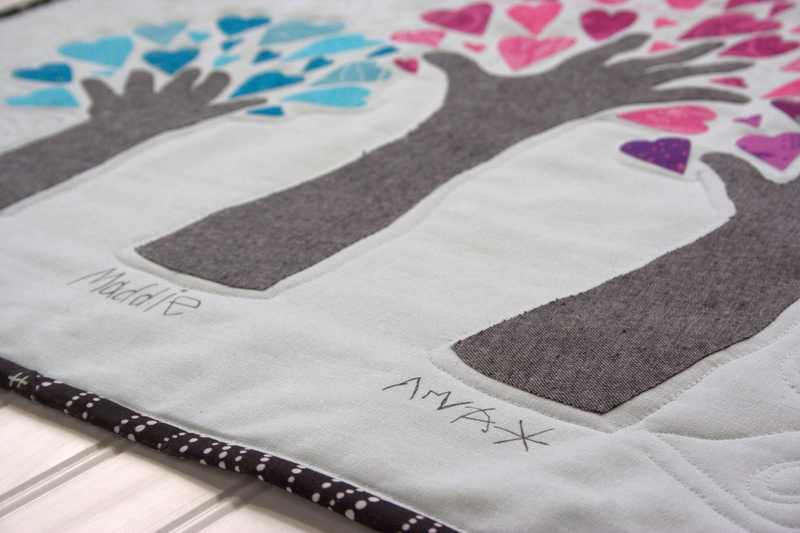 I initially hoped to make four of these, one for each set of grandparents (we are blessed to have three sets!) and one for us to keep. Now that I’ve finally finished the first one, I’m accepting the fact that I may just stop at one, since I would like to cherish my little babies’ hands, too, and Christmas is less than three (3!?) days away. 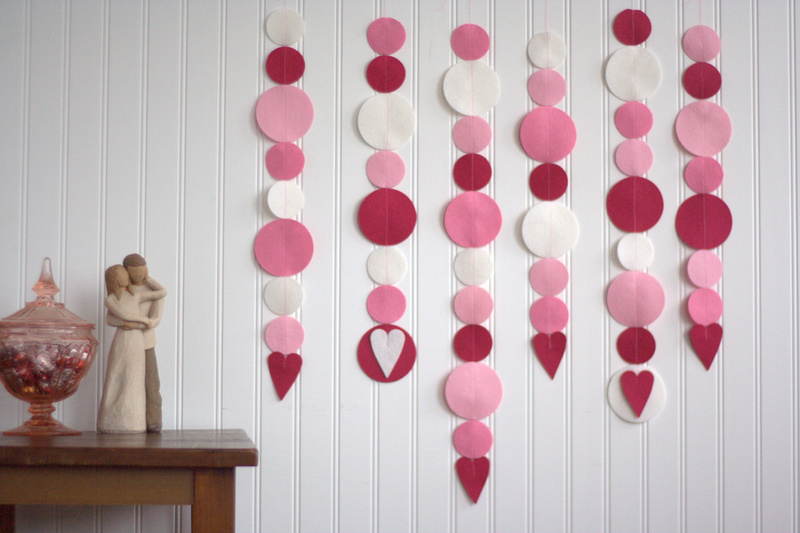 Since it involves hearts, this project would also be a fabulous Valentine’s Day gift for those doting grandparents. From the moment I gave birth to my first child, my holiday gift giving style changed completely. Instead of trying to think of the “thing” each family member would like or need most and focusing all of my time on making handmade gifts of love for every family member possible, I acknowledge that presence is the best present if at all possible, and as a busy mom (of three lovely children, now), gift making time is much more rare. I am blessed to have a large family, and to have married into an even larger family, so potential gift recipients abound. But especially in recent years, my parents and in-laws–the grandparents–are usually the sole recipients of Christmas gifts, and such gifts nearly always involve their cherished grandchildren (our kids). This year, grandparents will get a whole lot of love, since time wasn’t on my side with this project. When I had the idea to make heart-filled trees out of my children’s hands, I did my typical google search to see if it had been done before. I found this post, about a creation inspired by another creation, and I knew that that inspiration would need to take one more step into the quilting world to become a quilted gift. Here’s how to make your own Growing Tree. First, gather your materials. Note that material amounts will vary depending on the number of children you have and the size of the child. I’ve tried to include amounts for a single tree, but feel free to adjust as needed. I’ve also included affiliate links to products that I use and love. If you click through and purchase with these links, I will receive a small commission that will go toward funding all that goes into creating these tutorials and keeping my blog up and running. Children! 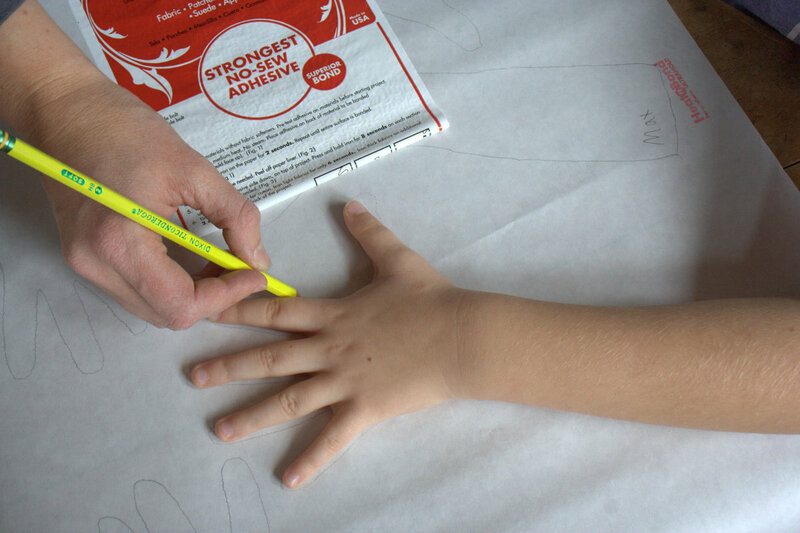 and a pencil for tracing their forearms and hands! 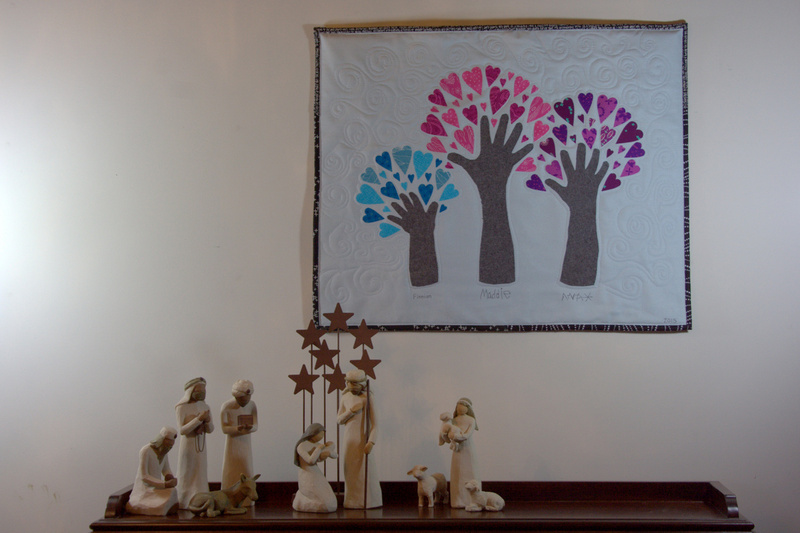 *These items are not needed if you opt to frame your growing tree instead of quilting it, but you will also need a suitably sized picture frame, stiff acid-free cardboard if the frame doesn’t come with it, and a form of adhesive (glue or tape) to tightly wrap the fabric around the cardboard before insertion into the frame. Carefully cut out each tree trunk, either enlisting the help of your children if they are older and proficient at cutting, or sending them off to play for the next few steps. Fuse your tree trunks to the wrong side of the tree trunk fabric, following the manufacturer’s directions. Always be extra cautious if using a hot iron with small children around. Toddlers are inherently curious and can not yet physiologically control their curious explorations, despite fervent warnings from mommy–as I’m sure you know! I do my ironing upstairs without any kids underfoot to be safe. Set the tree trunks aside to cool. Once cool, carefully cut around each forearm tree trunk and set aside. Fuse Heat’n Bond to the wrong sides of all of the fabric scraps that will become hearts. Remember to have the paper side of the Heat’n Bond facing up, and put a pressing cloth down to protect your ironing surface. Let cool completely. Once the fused heart-intended fabric has cooled completely, with paper-friendly scissors or rotary cutter (NOT your fabric scissors! 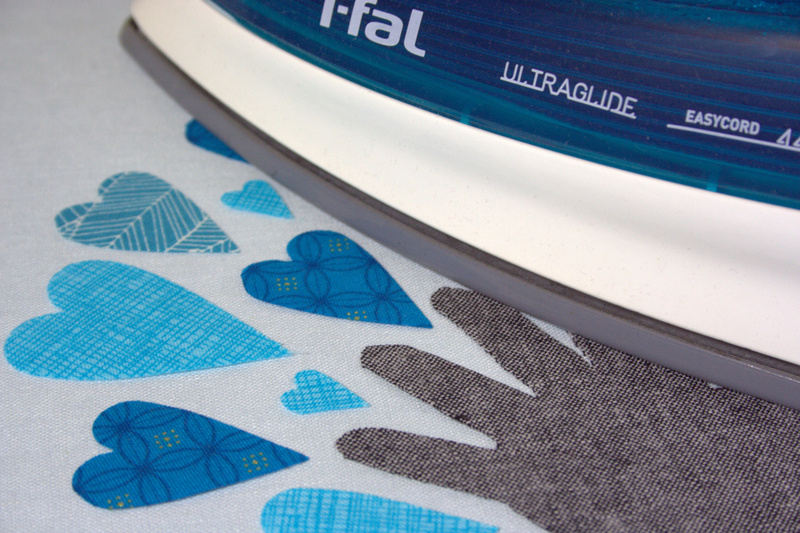 ), cut your fabric into 2 1/4″ x 3 1/4″ rectangles for ease of quick cutting.. Note that I am using the three smallest heart sizes for my trees, and am not worrying about directionality of the fabric. If you have smaller scraps or want the directionality of the fabric to be level, you can cut 3/4″ x 3/4″ for the smallest heart, 1 1/4″ x 1 3/4″ rectangles for the medium heart or 1 1/2″ x 2 1/4″ rectangles for the large. (I did not use the extra large heart). 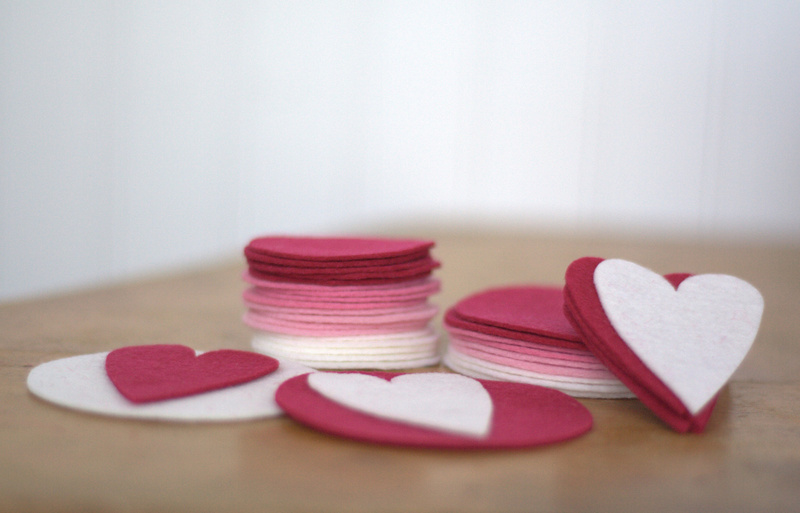 I mostly cut the medium and large hearts from 2 1/4″ x 3 1/4″ rectangles and then used the scraps from those to cut small hearts. 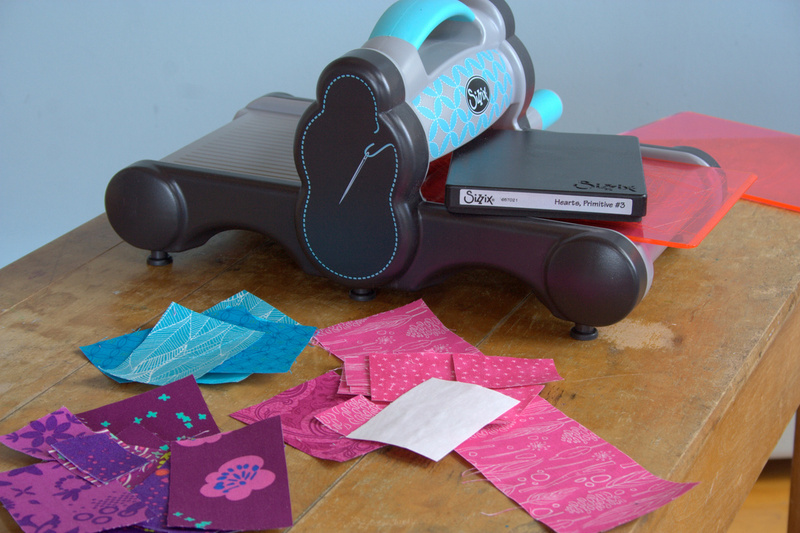 Next, pull out your Sizzix fabi die cutting machine and Primitive hearts #3 die. Call those children back! 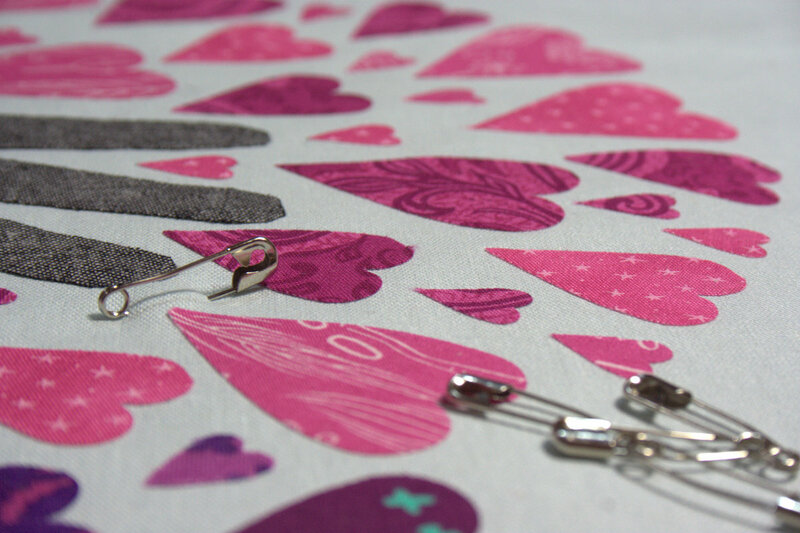 Layer the pre-fused fabric rectangles over the desired sized hearts on the Primitive Hearts die, four (4) at a time. 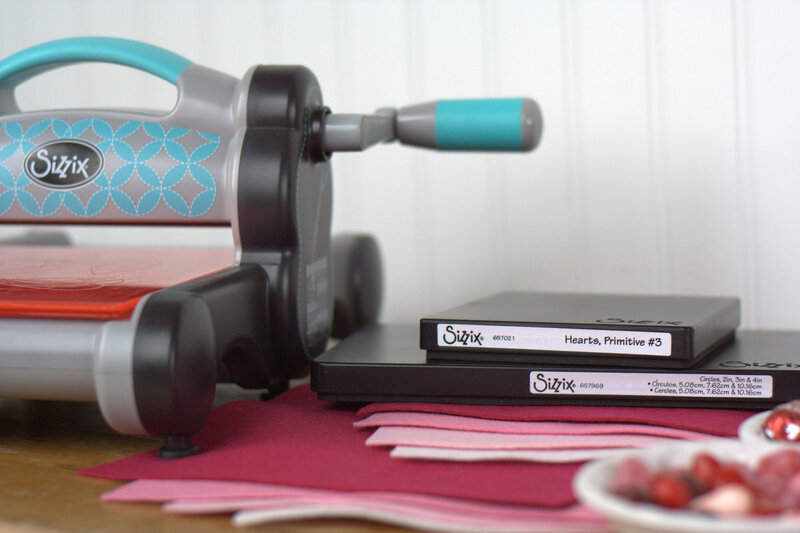 The Sizzix can cut up to nine (9) layers of fabric at once, but since the fusible is pre-fused, each rectangle counts as two layers. 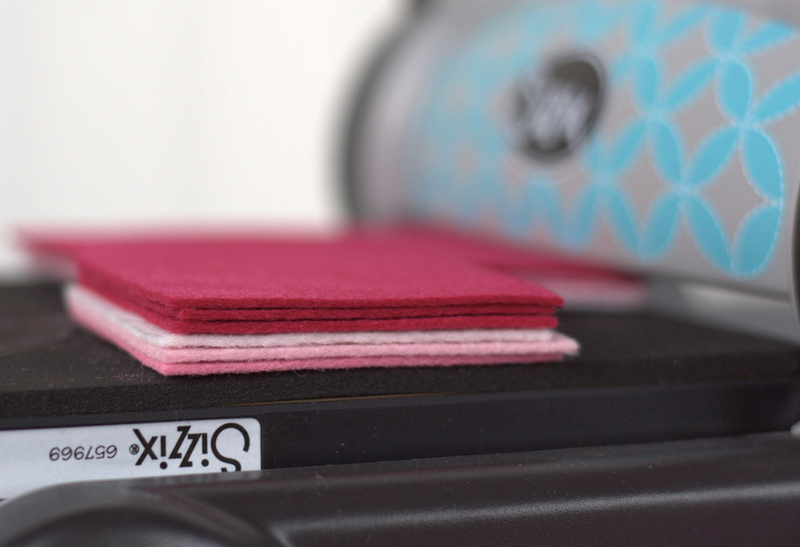 Make your Sizzix sandwich: bottom cutting pad, die with the blades facing up, fabric centered over the heart blades, and top cutting pad. 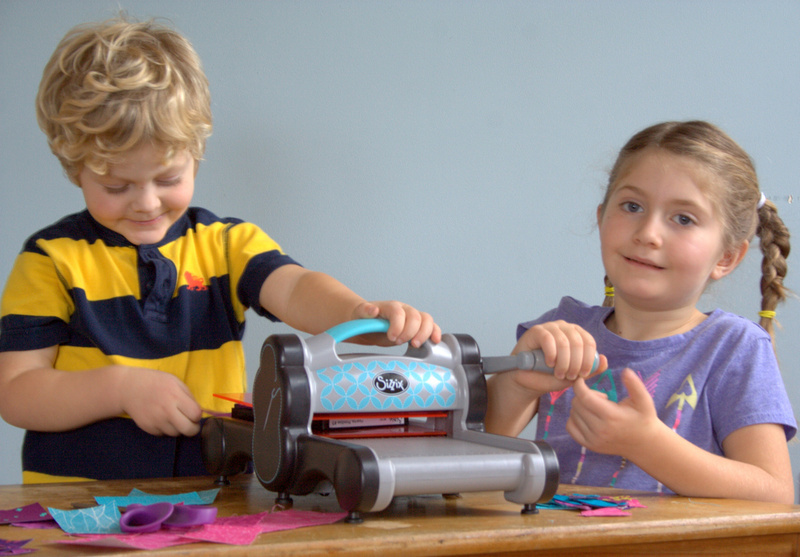 Let your kiddos carefully crank them through! 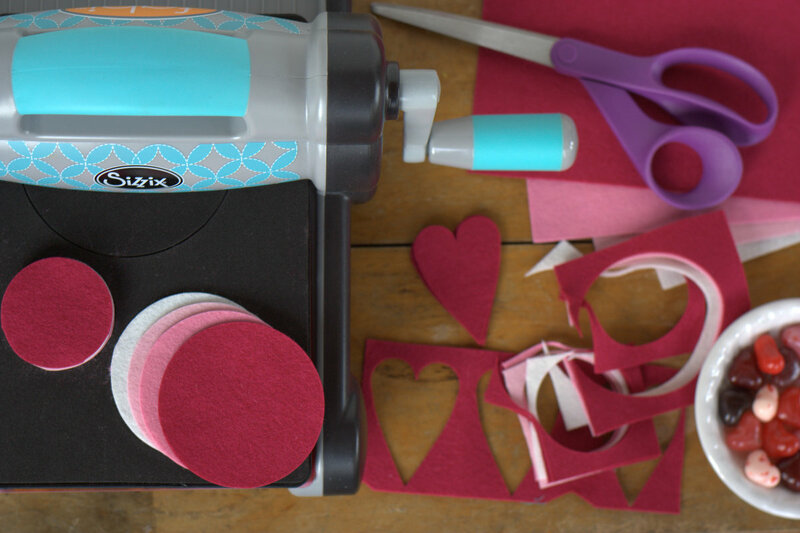 If you don’t have a Sizzix, get the kids’ help and start cutting out hearts of different sizes, ranging from 1/2″ to 2″ in size. 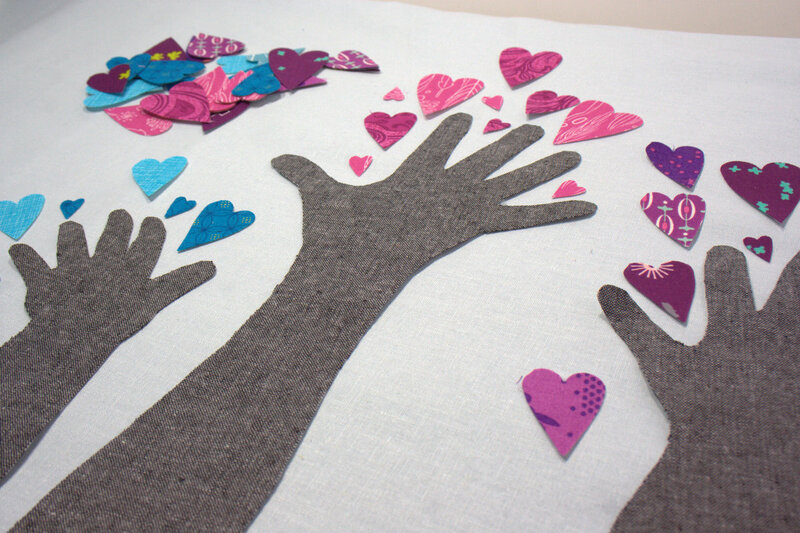 Depending on the ages of your children, you can either enlist their help or set them up with a different activity while you lay out the wall hanging once all of the hearts and trunks are cut. Lay out a large piece of your background fabric. I suggest arranging your tree or grove of trees BEFORE cutting the background fabric to size, since every child’s arm is different. Layout your tree trunk(s), arranging the hearts around the top like the leaves of a tree. 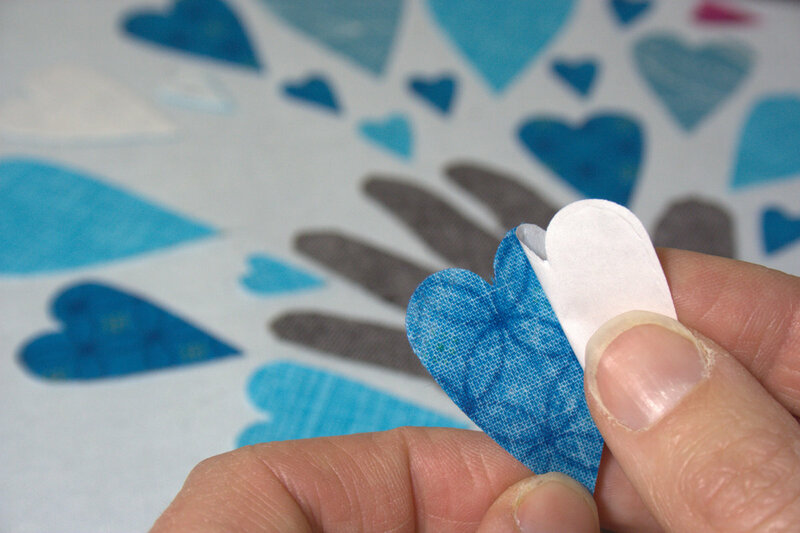 Once they are arranged the way you want them, carefully remove the adhesive paper from each component, placing it back in its proper place as you go. Once you have an iron-surface-sized batch with the paper backings removed, fuse them down. *Note: If possible, lay out your arrangement on your ironing surface so that once all of the papers are removed and pieces stuck, you can simply fuse them down. I used a large foam board beneath mine, and actually pressed onto the foam board since my ironing surface is tiny. Always follow the manufacturer’s instructions when using Heat’n Bond! If you’re like me and are interrupted during this process, simply flip a row of hearts that haven’t been fused yet, so that you know where you are when you return. 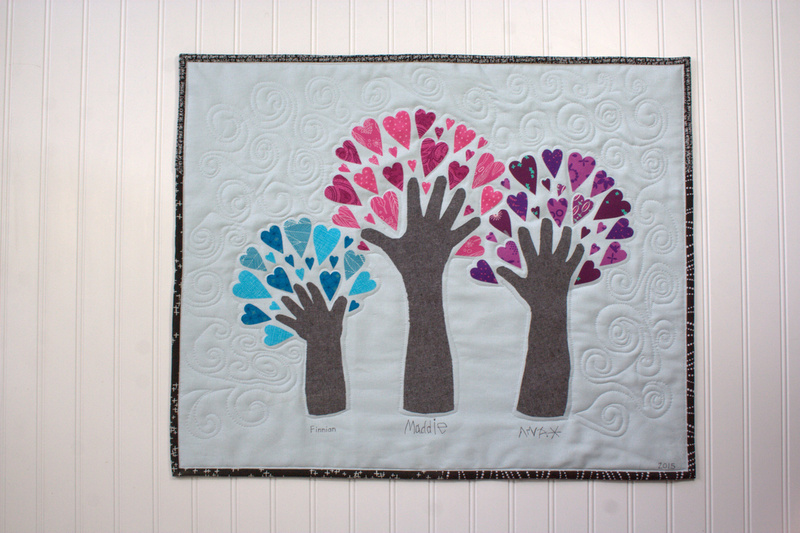 Trim the background fabric approximately 3″ from each edge of your Growing Tree if you plan on quilting. 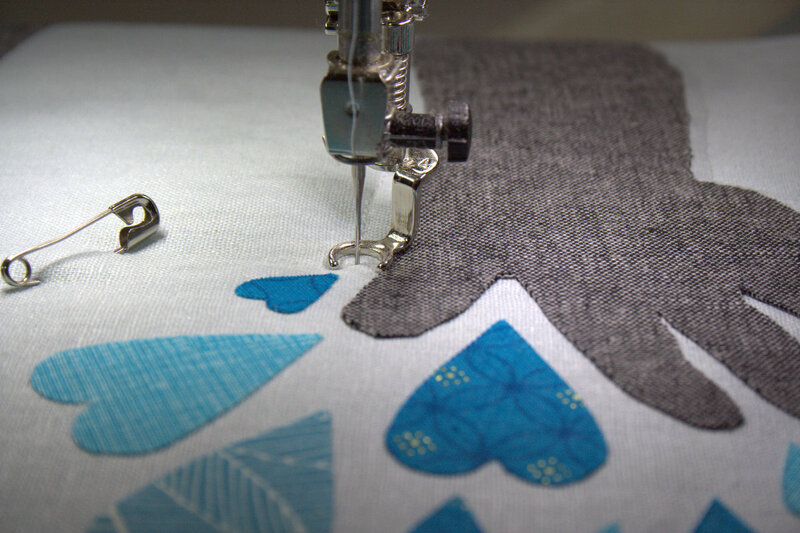 Be sure to use the lines on your cutting mat to ensure your quilt is square as you cut. Alternatively, after fusing the hearts and tree trunks, you could wrap the fabric tightly around a thick acid free piece of cardboard and frame it in a picture frame. If you opt to frame yours, be sure to give yourself at least 2″ of overhang on all four sides, and plan your tree arrangement to fit into your desired frame. Baste your quilt layers using your desired method (I used pins). 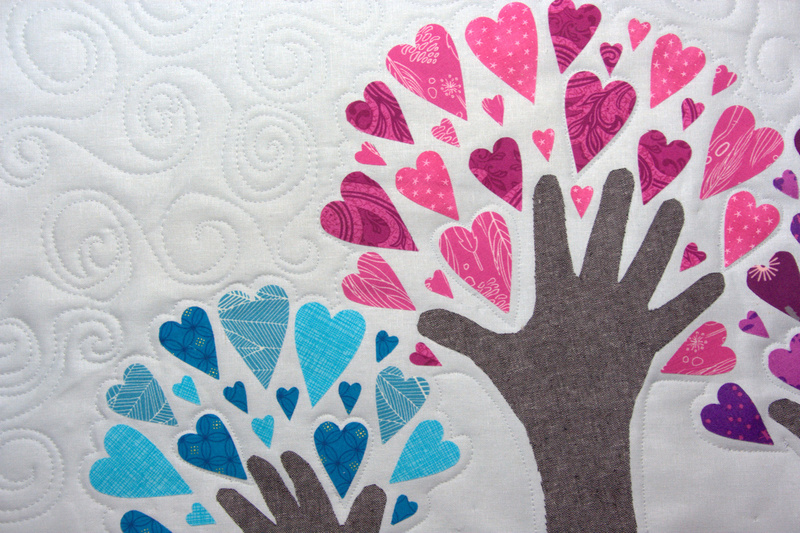 With a thread that coordinates with your background fabric, free motion quilt AROUND the edges of your tree trunk(s) and hearts. I also stitched around a few single hearts (you don’t need to sew around all of them) within the tree. Remember that the Heat’n Bond is NO SEW, so be sure not to sew on top of the fused pieces. Feel free to free motion quilt the background to help hold everything in place. I used a windy spiral design and was reminded at how much fun free motion quilting is! I need to do it more often! Trim the batting and backing flush with the quilt top, square up, and bind as desired. I included corner hang tabs on the back of my Growing Tree Grove using THIS method, and bound the quilt using THIS great tutorial by Cluck Cluck Sew. 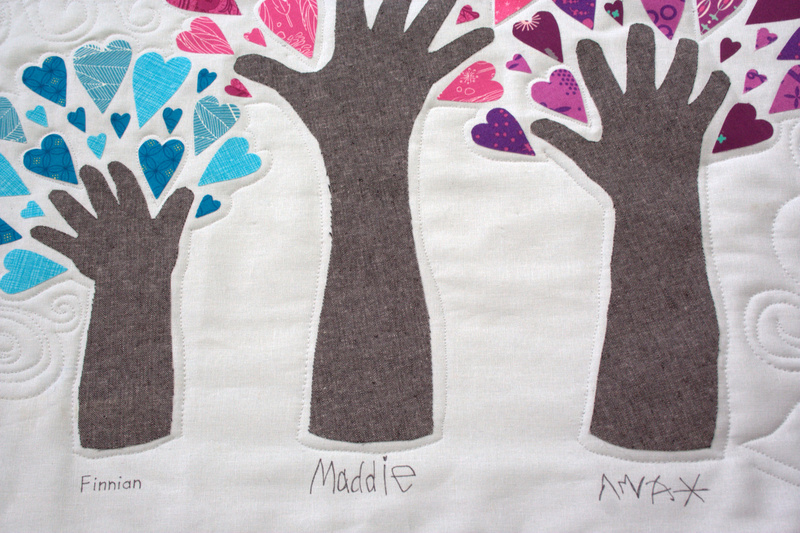 Hang this Growing Grove on your wall so that you can immortalize those precious little hands, or wrap & gift to those doting grandparents if you’re superwoman, or if you are already planning ahead for Valentine’s Day! Max does not. stop. moving! 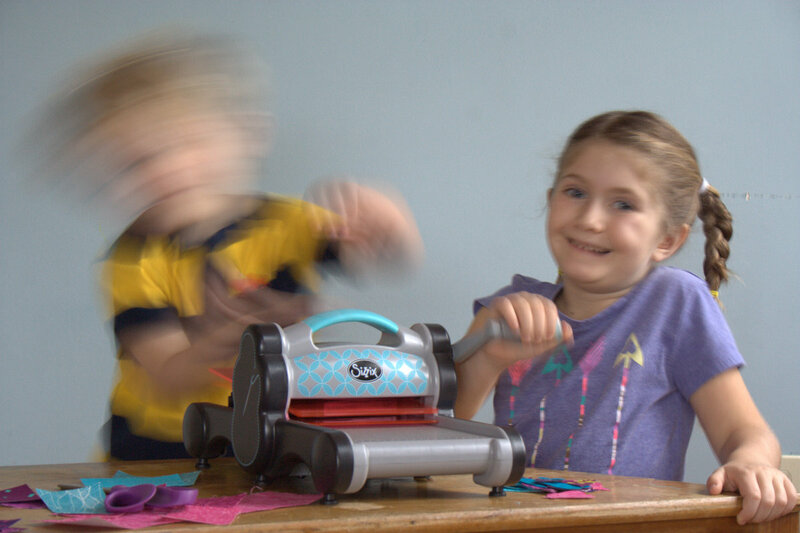 Enjoy the blurry laugh, and enjoy your holidays!